Says the young leader of the Amgen Tour of California: "The sport’s largely clean now and we have to keep it that way"
MT. DIABLO, Calif. (VN) — It had been following along with the peloton, for the most part unheard and unsaid, until the young American in the race leader’s jersey at the Amgen Tour of California felt comfortable enough to bring it up. It’s on us, Tejay van Garderen (BMC) said. Specifically, it’s up to a new group of U.S. cyclists to make certain the offseason cataclysm that brought down a generation of marquee names doesn’t happen again. The word he used: responsibility. When he spoke it after his time-trial victory on Friday, he wasn’t sure it was the right one. Honor, as in the honor of giving American cycling fans a clean show, might be better, he said. Yet after his third-place finish Saturday atop Mt. Diablo on stage 7 essentially clinched his first stage-race victory, he came back to his original thought. 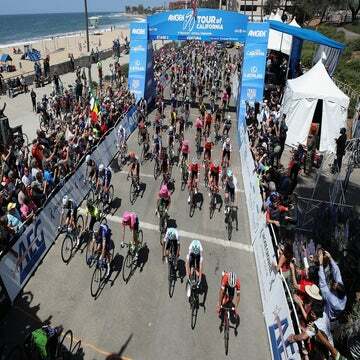 The Amgen Tour is the country’s first major stage race since doping dethroned America’s cycling royalty. Stepping out of the wreckage is a new generation, led by 24-year-old Van Garderen and this week including up-and-comers Lawson Craddock (Bontrager), at 21 the race’s best young rider, and mountains classification leader Carter Jones (Bissell), 24. Individually and collectively, they accept the responsibility. As the generation tasked with cleaning up not only the sport but the debris left by their predecessors, they’ve been out to prove something, both this week and going forward. Looking past doping is not necessarily easy, nor is the subject very far away. “Obviously, it’s a touchy subject. A lot of people who were implicated were on the team that I’ve been on for four years,” said 28-year-old Matthew Busche (RadioShack-Leopard), the 2011 U.S. national road race champion. With that new reality, for some, comes freedom. Liberated from the need to win — or at least compete — at all costs, America’s next wave looks at their sport with a sense of relief. “One of the things that [Slipstream Sports CEO] Jonathan Vaughters has been saying, and which really resonates with me, is that there’s no pressure. The pressure to do drugs doesn’t even exist,” Jones said. Doubters persist, said Lucas Euser (UnitedHealthcare), a pro since 2006. At 30, he is somewhat of an elder statesman of the next wave. That’s where van Garderen’s headlining week comes in. Each time he pulls on the race leader’s jersey and shares the podium with his American peers, they help put distance between them and the mess their predecessors left behind. “Right there, that is a transformation from the old times,” said Jens Voigt (RadioShack), who at 41 has seen the past, the present and now, the future. And he’s one that is more than happy to shoulder the burden of moving forward.